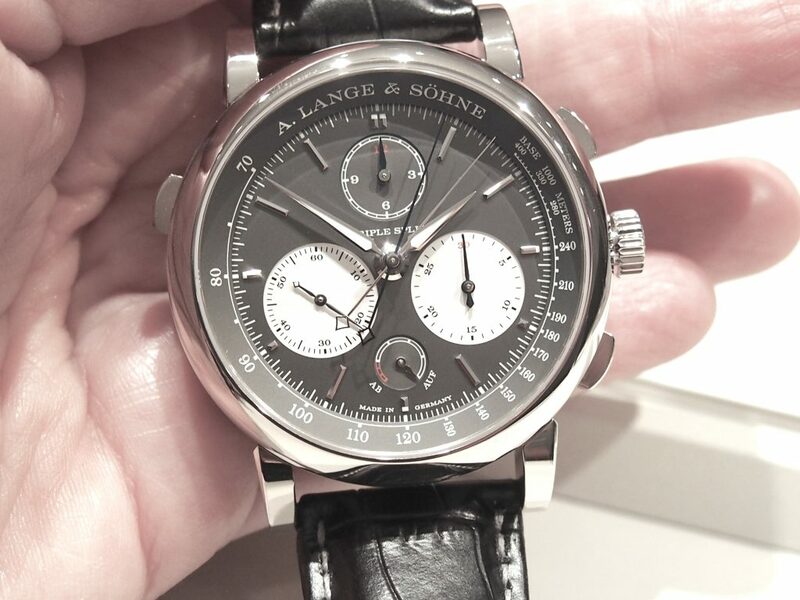 A. Lange & Sohne Triple Split chronograph. German brand A. Lange & Sohne continues to be an innovator in the haute horlogerie community. This year, the brand once again tops its own records, setting a new benchmark standard in chronographs with its remarkable Triple Split mechanical watch. 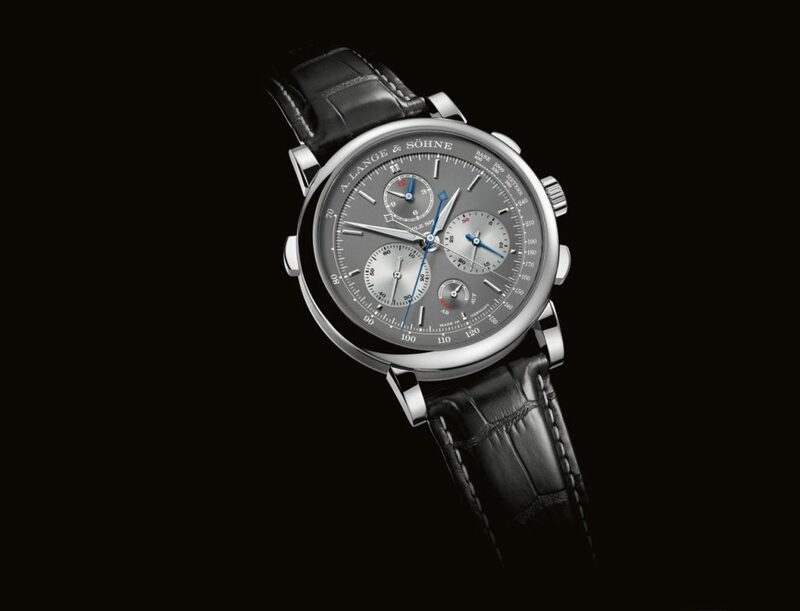 The world’s first split-seconds chronograph that enables the wearer to track comparative time measurement in larger than 60-second increments – in fact measuring multiple increments of up to 12 hours – the A. Lange & Sohne Triple Split is an incredible feat of technology, craftsmanship and vision. Before we delve into the aesthetics of the watch, or even the complexity of the incredible all-new in-house-made 567-part movement, we want to explain exactly what one can achieve with this limited edition masterpiece. Let’s keep in mind that until 2004, when A. Lange & Sohne unveiled the now-famed Double Split watch – then an incredible feat that had watch lovers referring to it as the Uber Chronograph – the market predominantly consisted of the chronograph (essentially a stop watch able to time an event from start to finish and then be reset), the flyback chronograph (able to offer instant reset/start of a timing session), and the Split Seconds or Rattrapante Chronograph (able to offer tracking of intermediate events such as each lap in a race, while continuing to track the overall event, as well). With the advent of the Double Split, A. Lange & Sohne was able to offer a timepiece that could split not only the timing of intermediate events in terms of seconds, but also could split the timing function for the minute counter, enabling timing of elapsed times up to 30 minutes. 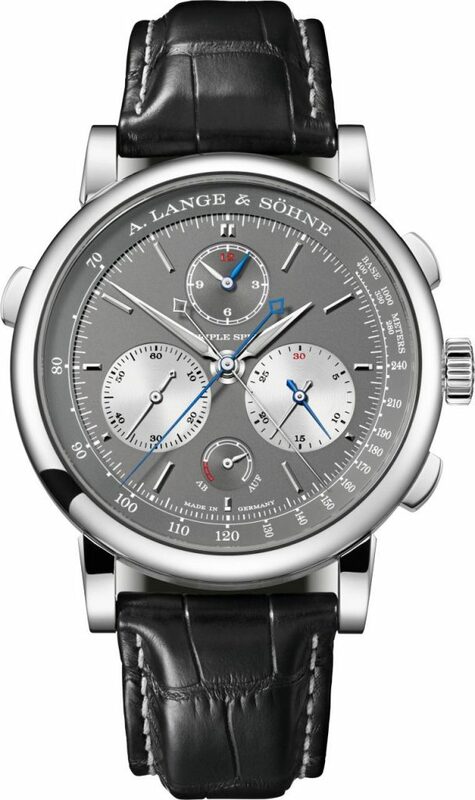 A. Lange & Sohne Triple Split chronograph offers split timing for seconds, minutes and now, also hours. Now, the Triple Split watch not only includes a Rattrapante for the seconds and the minutes (as in the Double Split), but also incorporates a third Rattrapante hand on the hour totalizer that enables timing of intermediate events of up to 12 hours. So, for the first time ever, a single watch not only tracks events into multi-hour durations, but also can time two opponents in their races for those long-time durations. It has other abilities, as well, that could be useful to certain people – perhaps those traveling multi-leg-flights to get to a destination and only want to know how many hours they have logged in the air. 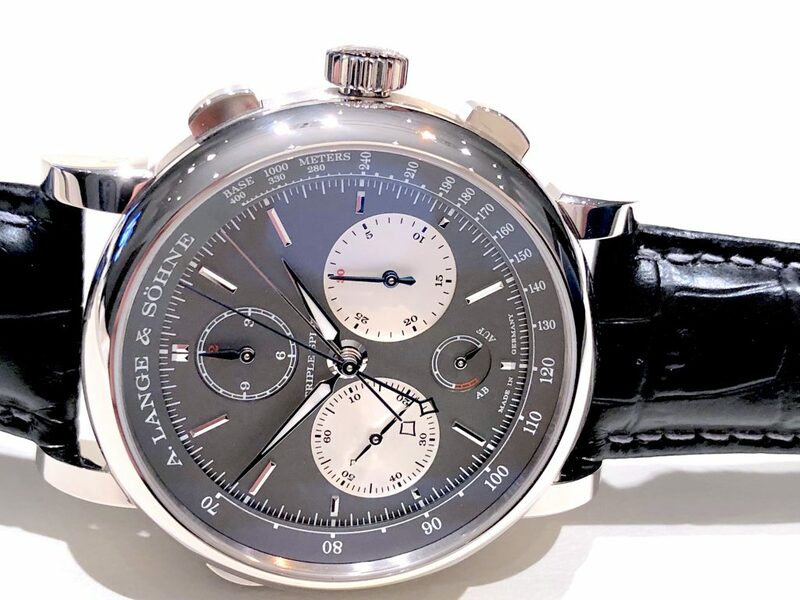 With the A. Lange & Sohne Triple Split, they can measure times of consecutive events (consecutive flights, for instance), and can add those together for a total measurement. The possibilities for use seem mind boggling, just like this watch. A. Lange & Sohne Triple Split chronograph may well be the most complicated chronograph in the world. Before even explaining how the watch works, it is important to note a key distinction in design of the hands. 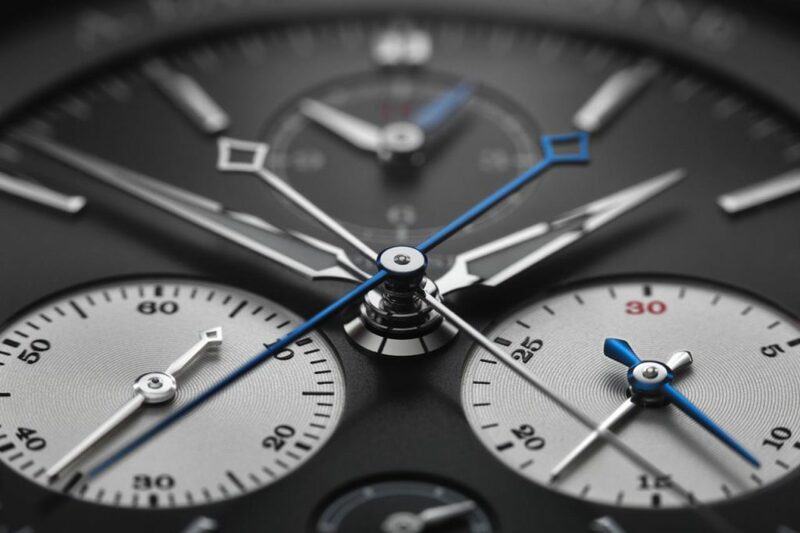 The three Rattrapante hands that split off from the rhodium chronograph hands are created in blued steel – easily recognizable as the split tracking devices. The hands that track the time are created in rhodium-plated gold and for ease of telling the time in the dark, the hour and minute hands have a SuperLuminova coating. When the chronograph functions are not in use and the watch is simply in normal function mode, each of the three Rattrapante hands is neatly tucked beneath its corresponding chronograph hand. So the sweep seconds hand, the minute- and the hour-counter hands, are all basically not in typical view. However, once the user starts the chronograph timing function, each of the hands simultaneously swoops out from hiding and begins its respective tracking duties. During this time period exactly 10 hands can be seen on the dial. However, thanks to A. Lange & Sohne’s masterful watch designers, it is easily determined which hands are preforming which jobs. 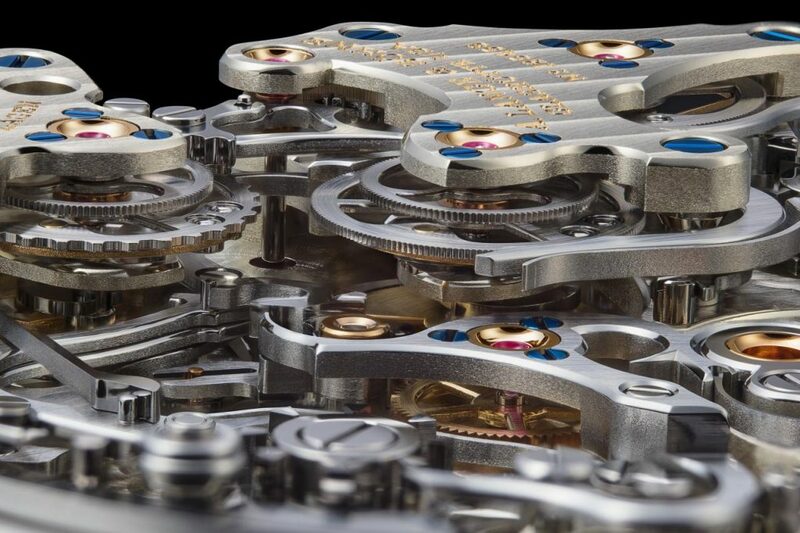 The complex movement of the A. Lange & Sohne Triple Split chronograph consists of 567 parts. Each time the wearer presses a button to stop an intermediate event – for instance one racer just finished lap one — the blued steel Rattrapante hands stop and the intermediate time for that event is on display. The rhodium plated chronograph hands continue their journey of timing the entire event. When the wearer has reviewed the intermediate time and presses the Rattrapante button again, the stopped blued Rattrapante hands fly into position – catching up immediately with the chronograph hands, once again at the ready for another intermediate timing event. The dance of hands is a perfectly choreographed event that is at once a tremendous feat of mechanics and a mesmerizing phenomenon. The caliber L132.1 is an entirely new movement developed specifically for the Triple Split. Even with the added functionality and enhancements inherent in this complicated caliber, A. Lange & Sohne was able to achieve a manageable case size. That, however, was not the brand’s most difficult obstacle. Among the great challenges the brand’s watchmakers had to overcome in the making of a precision timepiece with a triple Rattrapante mechanism was how to enable the three hand pairs (the Rattrapante and chronograph seconds, minutes and hours) to operate in unison collectively, or on their own separately. This required the development of multiple arbors in a complex layout in the movement. Additionally, A. Lange & Sohne incorporates a patented disengagement mechanism into the Triple Split that ensures accuracy of chronograph and Rattrapante tracking. In addition to ensuring that all 10 hands on this complicated watch are easily distinguishable, A. Lange & Sohne has made room at 6:00 on the dial of the 43.2mm watch to display the power reserve in its beloved Up/Down display method. This placement of the tiny subdial offers a harmonious balance to the18-karat white gold watch. The solid silver dial is finished in the much-coveted rich gray color that A. Lange & Sohne is also known for. The transparent sapphire case back reveals the incredible workings of what may well be the world’s most complex chronograph. 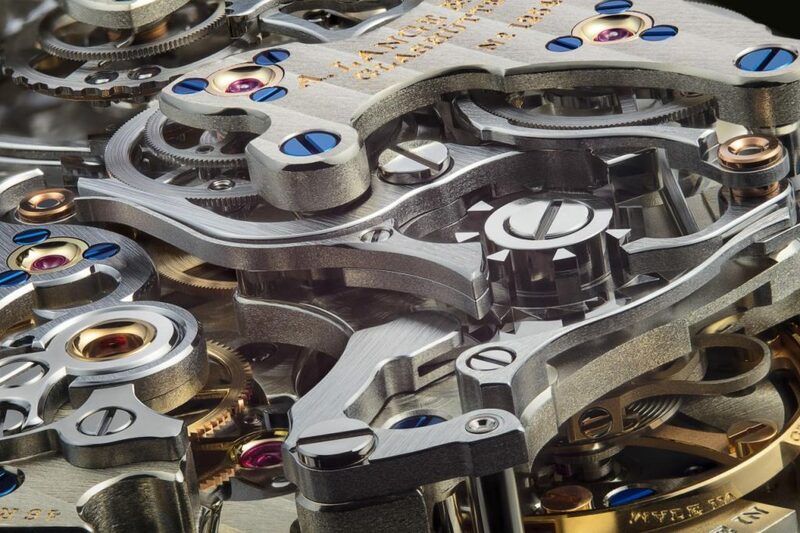 The triple Rattrapante gears and levers are on full display and are finished to the highest and strictest standards of excellence that A. Lange & Sohne commands. Via this caseback, one can witness the dance of levers, wheels and components in a three-dimensional format as they perform their tasks with elegance. Sadly just 100 pieces of the Triple Split will be made, each retailing for $147,000. Just 100 pieces of the A. Lange & Sohne Triple Split will be made, each retailing for $147,000. This watch has so much to offer that it can sound overwhelming. However, holding it in my hands, I was impressed not only by its easy-to-read design, but also by the architecture of the movement. I am disappointed that with all of its ingenuity, A. Lange & Sohne couldn’t have made this a swivel watch because honestly, I would have a hard time deciding which side – the amazing dance of hands or the incredible labyrinth of magnificently finished mechanical components – to display on my wrist at any given moment. Hands down (pardon the pun) this is a “be still my heart” watch. The piece is striking and serves as yet another reason why A. Lange & Sohne continues as a leader in the industry. For a select 100 watch lovers, Christmas has come early in the form of a testament to mechanical wizardry on their wrists. Giving the measurement capabilities of the piece, it is surprisingly intuitive to navigate. This is the perfect watch for the next time you are in Monaco and need to time the laps of your favorite F1 racers. Close-up details of the dial of the A. Lange & Sohne Triple Split Chronograph. May 11, 2018 in A. Lange & Sohne, Brands, Collectors' Corner, Educational info, News, Reviews and Articles, SIHH 2018, Timepieces News, Reviews and Articles, Watch Shows 2018.